Camp Chef's New Expedition 2X Double Burner Stove includes two 30K BTU burners and a professional fry griddle making it one of the most versatile stoves in its class. 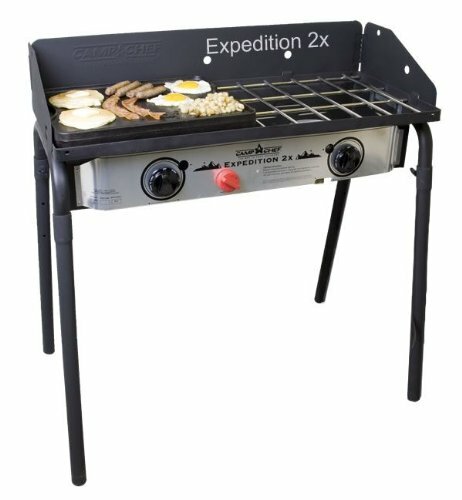 The Expedition 2X features removable legs for easy portability and storage as well as an easy to use Matchless Ignition System for hassle free cooking. The steel griddle is designed to fit over on burner and the built-in heat skirt provides even heat distribution for more efficient cooking. Because this griddle comes with Camp Chef's "True-Seasoned finish, it is ready to use right out of the box. Griddle works great for stir-fry's, fajitas, breakfasts, steaks, etc. As an added bonus the new Expedition 2X package also includes a Three-Sided Windscreen to help keep the flame burning strong in windy conditions. With this package you should be able to cook anything - anywhere - anytime just like you would at home. Includes a reversible Cast Iron Grill/Griddle that covers one burner.